On a national level commemorations repeatedly refer to the period of the mid-1840’s to the mid-early 1850’s as the “Irish Famine”. Although the population was indeed decimated in that time, there was in fact no famine as there was no shortage of food. In a famine, people die from starvation and illness related to hunger due to a shortage of food. But in Ireland, at the time of the Great Hunger, there was an abundance of food. Although the potato crop failed as it did throughout Europe, tens of millions of tons of food was shipped out of Ireland, mostly to English ports, wheat, oats, barley, mutton, lamb, pork, ham, beet, eggs, live cattle, sheep and pigs, flour, butter, lard and so on. Since 40 to 70 shiploads per day sailed from Ireland’s ports, vast quantities of food protected by some 100,000 troops plus police, navy and coast guard, while the people watched and starved. This is why we in the National Graves Association refer to the period as the “Irish Holocaust”, for that is what it was. The myth local to this area, Fingal, is that the Irish Holocaust did not affect this area. When I asked the current holder of this land for permission to hold today’s commemoration, his response was “But there was no famine here”. And almost anybody in this area believes that to be the case. This grave served the North Dublin Union, more commonly known as the Balrothery Workhouse. Although the records of the workhouse are now incomplete, the ones that do exist show that the vast majority of the people buried here died during the Great Hunger and that they died of the diseases associated with it, principally dysentery, diarrhoea, typhoid and cholera. In 1845, about three quarters of the potato crop was lost in Fingal, followed by a total loss in 1846. Typhoid spread through the area in 1846 and cholera broke out in Balbriggan in May 1849 and spread rapidly. In 1846, local relief committees were formed in attempts to prevent mass starvation. As in other parts of the country, the relief committees found that the most cost effective means of providing food relief was with Indian meal, a poor quality form of maize imported from Britain’s Indian colonies. This was crushed and added to warm water to form a gruel or soup. It was believed that people could survive on one pound of meal per day for adults and half a pound for children and that became the accepted daily ration. In November 1846 the Relief Commission (an arm of the British Civil Service) wrote to all local relief committees pointing out that contrary to Government policy to provide “outdoor relief” (i.e. food outside of the workhouse) without work, able bodied men had to work at least 8 hours per day and the sick and disabled must be “occupied to the extent of their ability”. Nevertheless, the relief committees operated soup kitchens in virtually every population centre in Fingal, and by August 1847 three and a half thousand people were being fed daily. But on August 15th 1847 “outdoor relief” was officially terminated by a British Government Order. Every soup kitchen in Fingal was immediately closed, under threat of police action. The Poor Law Commissioners, appointed by the British Government, were vehemently opposed to outdoor relief which they described as “the evil which must be guarded against”. They made exception for “destitute widows with at least two dependant legitimate children, orphans, the disabled and mentally ill”. From August 1847 men had to work 8 hours per day in the stone breakers yards to qualify for 1 lb. of meal per day for themselves and ½ lb for their children. Furthermore (under the infamous Gregory Clause) farmers had to surrender their land and in Fingal 220 of them did so. In 1848 the Poor Law Commissioners appointed local guardians. Many of the appointed guardians were the same people who had been running the Relief Committees. distribution depots were quickly opened in Skerries, Balbriggan, Rush, Lusk, Donabate, Swords, Malahide and The Naul. But in December 1849 all these depots were closed by Government Order. An exception was granted to allow food distribution to the elderly and infirm, but this exception was also terminated in August 1850. “The Famine didn’t affect this area”. In the census of 1841 the population at Lusk was 2,100. In 1851, it was less than 1,000. “The Famine didn’t affect this area”. The Poor Law Acts allowed workhouses to export orphaned teenage girls to the colonies to “help address the gender imbalance”. The first batch of girls to be exported under this section of the Acts was a group of ten girls sent from Swords to Australia in 1849. A further 73 people were sent from Swords to Quebec in June 1850. “The Famine didn’t affect this area”. 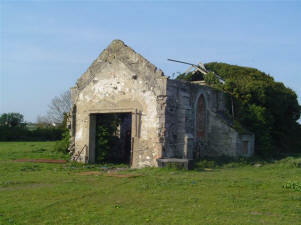 In Lusk the official records some 400 houses were demolished in Fingal from 1841 – 1851 and a further 140 abandoned. The Irish Holocaust certainly did affect this area, and those buried here were amongst its many victims. We in the National Graves remember and honour them. They were as much the victims of the British occupation of their country as the many men shot against a wall. In many ways more so, for they also watched their children die or their parents, or their siblings, or their spouses. No doubt in some cases all of the above. It would be a sad thing indeed, to now forget their suffering and loss, and we here today will not do so. “Balrothery Poor Law Union” by Sinead Collins, 2005. “The Mass Graves of Ireland” by Chris Fogarty, 1996.